A brow or forehead lift is designed to restore a more youthful appearance by improving such facial characteristics as drooping eyebrows, hooded or drooping skin at the outer part of the eyes, furrowed forehead, and horizontal frown lines at the top of the nose. The result is a better eyebrow position with a more alert and less tired appearance, smoother forehead skin, and softer lines between the eyes. A forehead lift may be performed in conjunction with a facelift or blepharoplasty. Men and women of all ages benefit from forehead lifts. Your age, skin characteristics, medical history, and other factors will help your surgeon decide if you are a good candidate for a forehead lift. If you wish to see how you might benefit from this procedure, stand in front of the mirror and place your hand across the upper part of your forehead, spreading your thumb and ring finger so that each is on the outer edge of one brow. Then gently slide the skin upward to raise your forehead and brows. This roughly approximates how you might look following a forehead lift. This 25 year old man (5´5″ | 132 lbs) was frustrated that he was always told that he looked tired. He does not like the protruding fullness of his lower eyelids. Exam showed pseudoherniation of lower eyelid fat without any skin excess. A transconjunctival lower blepharoplasty was performed with good result. Read what patients are saying. Are your eyelashes thinning over time? Over the years, your eyelashes may get thinner. 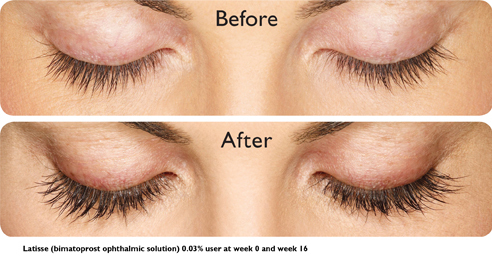 Latisse (bimatoprost 0.03% ophthalmic solution) can make a real difference in how your lashes look… in just 16 weeks. Latisse is the first and only FDA-approved product to grow lashes fuller, thicker, and darker. So if you are unhappy with your lashes, Latisse can make your eyes prettier and more defined.